The VM610MONO Mono LP model of the VM type dual magnet cartridge utilises the specialised 600 series mono body with internal wiring dedicated to monaural sound and is equipped with a dedicated mono conical bonded stylus. 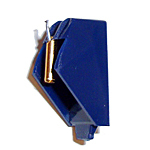 The cartridge features an aluminium cantilever, para-toroidal coils to improve generating efficiency, mono body terminating left and right channels to reduce surface noise and durable low resonance polymer housing. 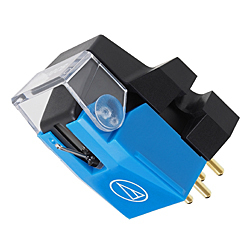 The new VM range of cartridges incorporate Audio Technica's internationally patented dual magnet design that replicates the structure of the vinyl cutter head by using two magnets arranged in the shape of a "V" to match the position of the groove walls. 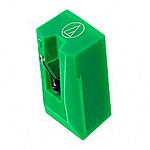 The styli fitted are interchangeable so it is possible to change between Mono LP and Mono 78 conical stylus types at any time.